The CEP is a public document that contains district policies and practices and may contain details related to peer observation. 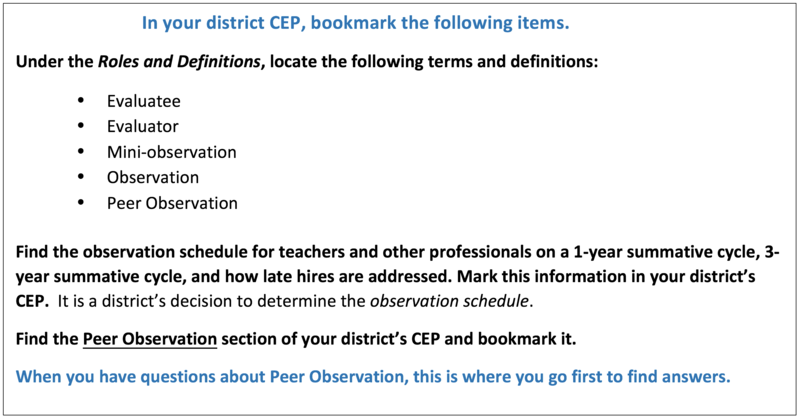 As a trained peer observer, you will want to be familiar with your district’s CEP. An evaluator can also be a peer observer. If I have questions about procedures for conducting a peer observation in my school, I should first consult the Kentucky Department of Education. Peer observers are not required to provide principals with details from the observation or post conference. Peer Observation is the most flexible component of PGES.